She has appeared in a variety of Australian dramas, from Neighbours, Underbelly, House Husbands and The Wrong Girl, is a mum of six children under 12, married to chef, Shannon Bennett, and a children’s author. Peninsula Kids Magazine talks to Madeleine West about the launch of her new book series for children, Lily D V.A.P., and mum life. With the first three books of the series released in May this year, the beloved Australian actor and mother of six says her inspiration for this series began with her young daughter being bullied at school a few years ago. Searching for answers on how to handle this issue became the catalyst for creating the main character in the books. “Without being able to find anything to address this issue, I decided to create a nine-year-old character who is something to aspire to and also the kind of girl that they want to be like and also have as a friend,” said Madeleine, with the result being Lily D V.A.P, an eight-year-old method actor who each week in drama class, takes a walk in the shoes of the characters she plays. Madeleine says as a mother, she is exposed to a variety of children day in day out and is acutely aware of their concerns. “One of the biggest concerns for me is the power our society, so driven by image, has on our children. Our kids are the first generation born into the cult of celebrity, where the way they look and how they are seen by others defines who they are. So I created Lily. D. Yes she is an actor in the making but for all the right reasons – learning to walk in another’s shoes and see the world through another’s eyes. My ultimate aim is to show children that the greatest gift you can give is to treat others with kindness, respect, empathy and understanding,” she said. For Madeleine, writing this series has been a cathartic experience, with Lily a large part being autobiographical. Lily.D, V.A.P follows the adventures of Lily, a jump-off-the-page, totally believable character who is full of beans, follows her dreams, and really REALLY loves beads. It’s her dream to become a performance artiste when she grows up, a V.A.P (a Very Amazing Performer). But Lily is no child star; she understands that success requires hard work and respect. Lily is a method actor with a difference. In each book in the series Lily ‘goes method’ to inhabit a character from a famous play or musical. By walking in another person’s shoes, Lily learns to see the positives in everyone and discovers that the greatest gift you can give in this world is to treat others with kindness and respect. The series covers some of the curliest questions our children ask of us, and addresses major topical issues our children face every day. Madeleine West is also the author of parenting book Six Under Eight, published in 2016. 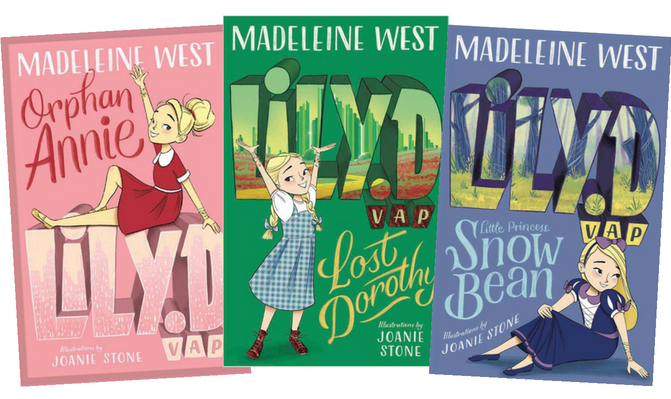 Lily.D, V.A.P, which is pitched at junior readers (5-8 years), hit the shelves on May 1 this year. RRP $12.99 each book.